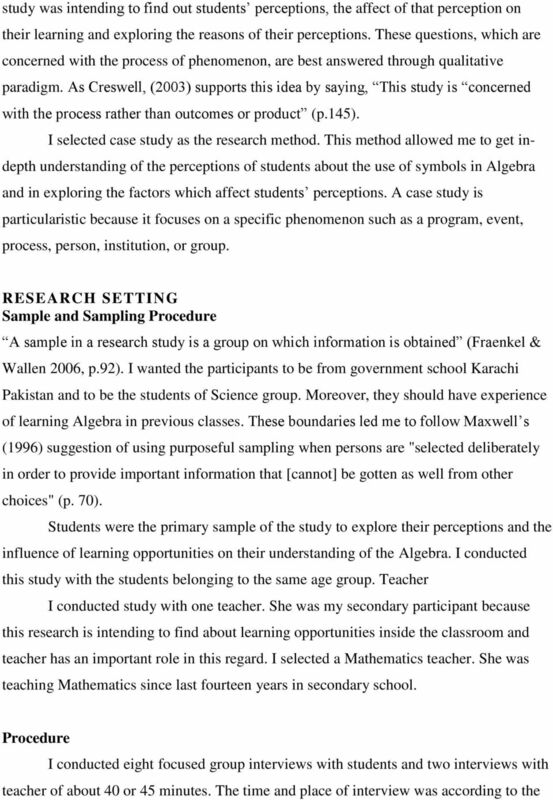 Download "INTRODUCTION FRAME WORK AND PURPOSE OF THE STUDY"
1 STUDENTS PERCEPTIONS ABOUT THE SYMBOLS, LETTERS AND SIGNS IN ALGEBRA AND HOW DO THESE AFFECT THEIR LEARNING OF ALGEBRA: A CASE STUDY IN A GOVERNMENT GIRLS SECONDARY SCHOOL KARACHI Abstract Algebra uses symbols for generalizing arithmetic. These symbols have different meanings and interpretations in different situations. Students have different perceptions about these symbols, letters and signs. 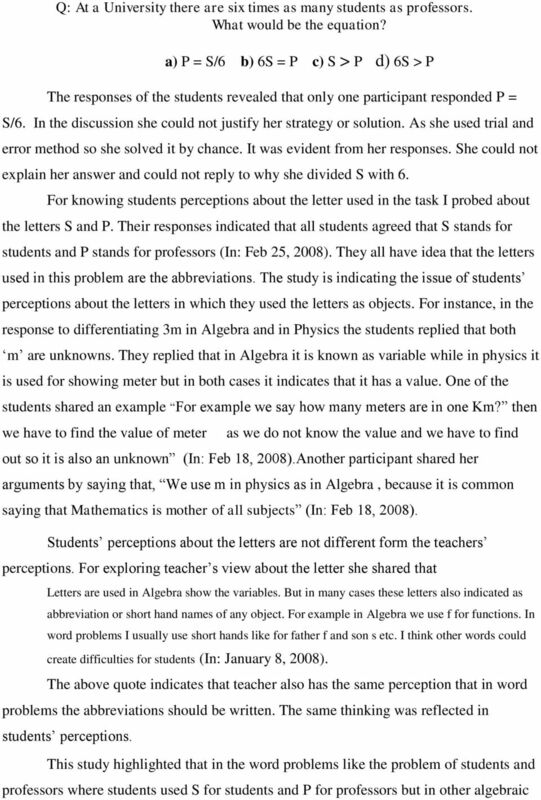 Despite the vast research by on the students difficulties in understanding letters in Algebra, the overall image that emerges from the literature is that students have misconceptions of the use of letters and signs in Algebra. 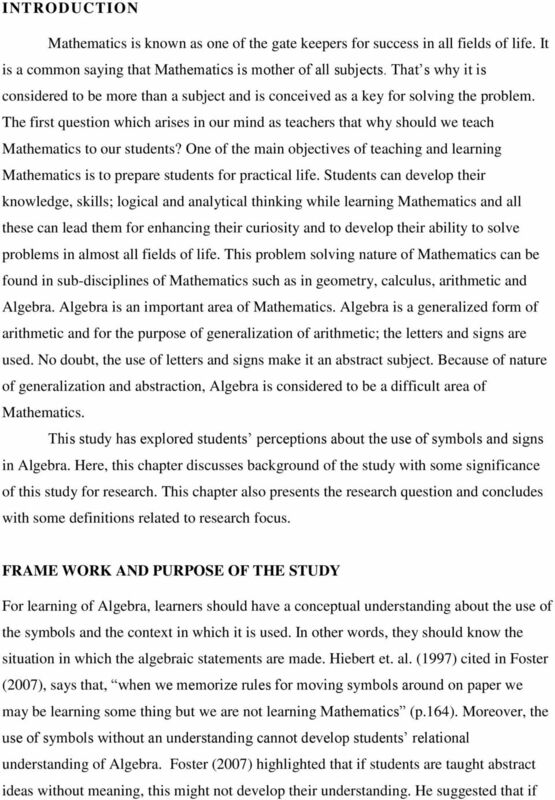 My empirical research done through this study has revealed that the students have many misconceptions in the use of symbols in Algebra which have bearings on their learning of Algebra. 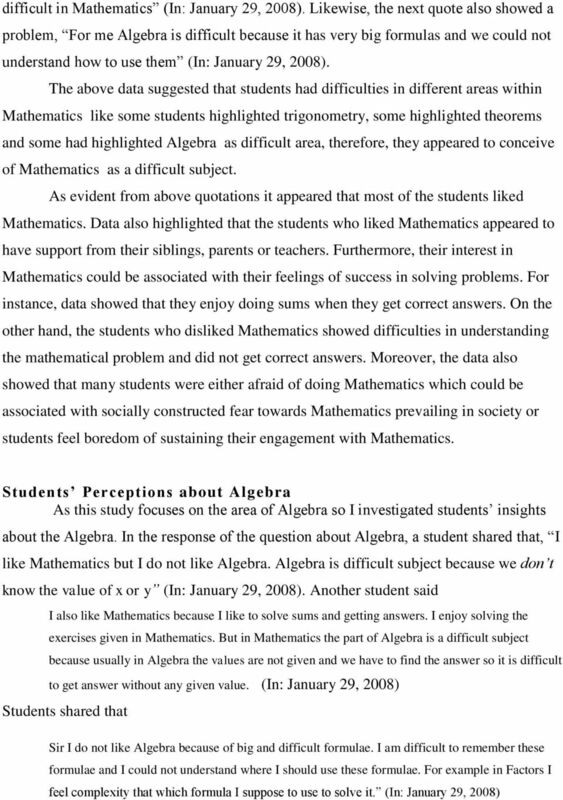 It appears that the problems encountered by the students appeared to have connection with their lack of conceptual knowledge and might have been result of teaching they experience in learning Algebra at the secondary schooling level. Some of the findings also suggest that teachers appeared to have difficulties with their own content knowledge. 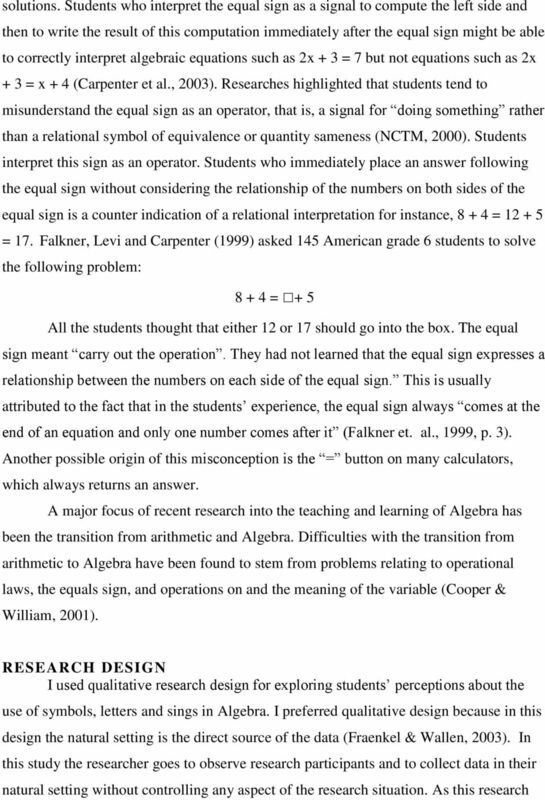 Here one can also see that textbooks are also not presenting content in such an elaborate way that these could have provided sufficient room for students to develop their relational knowledge and conceptual understanding of Algebra. 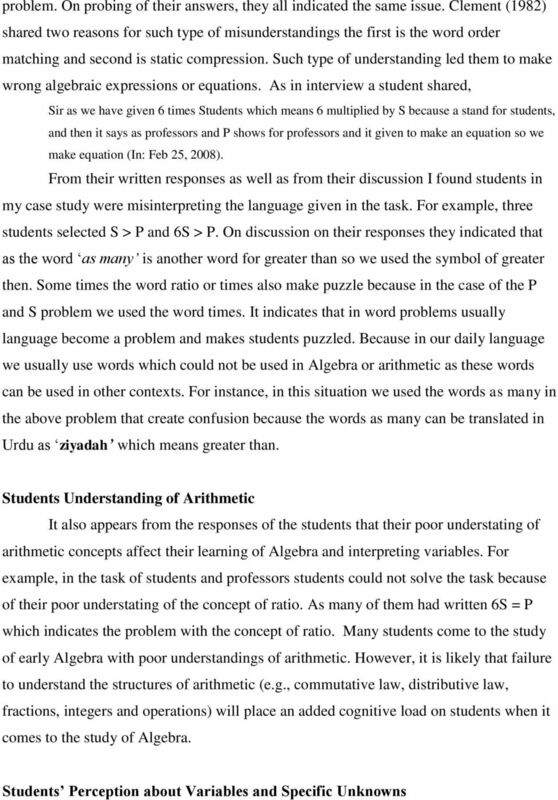 Moreover, this study investigates students difficulty in translating word problems in algebraic and symbolic form. They usually follow phrase- to- phrase strategy in translating word problem from English to Urdu. This process of translating the word problem from English to their own language appears to have hindered in the correct use of symbols in Algebra. 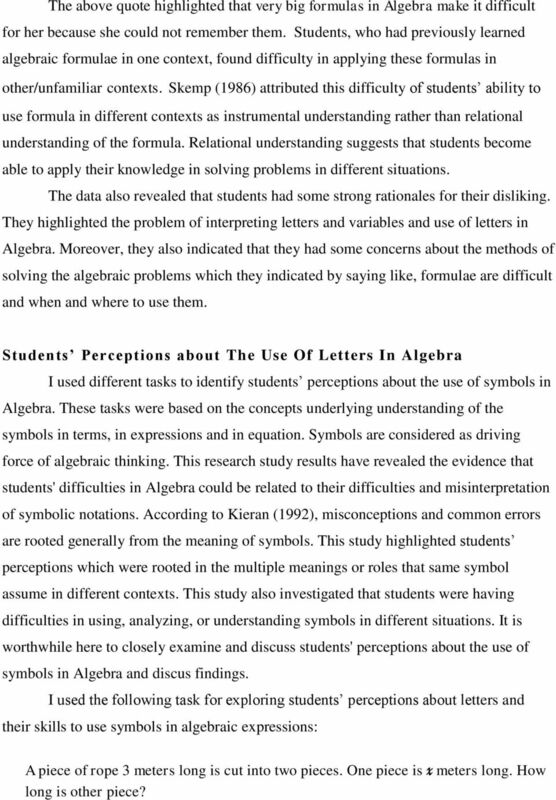 The findings have some important implications for the teaching of Algebra that might help to develop symbol sense in both students and teachers. By the help of symbol sense, they can use symbols properly; understand the nature of symbols in different situations, like, in functions, in variables and in relationships between algebraic representations. This study will contribute to future research on similar topics. 5 cope consistently with items that required the use of a letter as a specific unknown. Schoenfeld and Arcavi (1988) cited in Bergeson, et.al. (2000) argue that understanding the concept of [variable] provides the basis from transition from arithmetic to Algebra and is necessary for the meaning full use of all advance Mathematics. 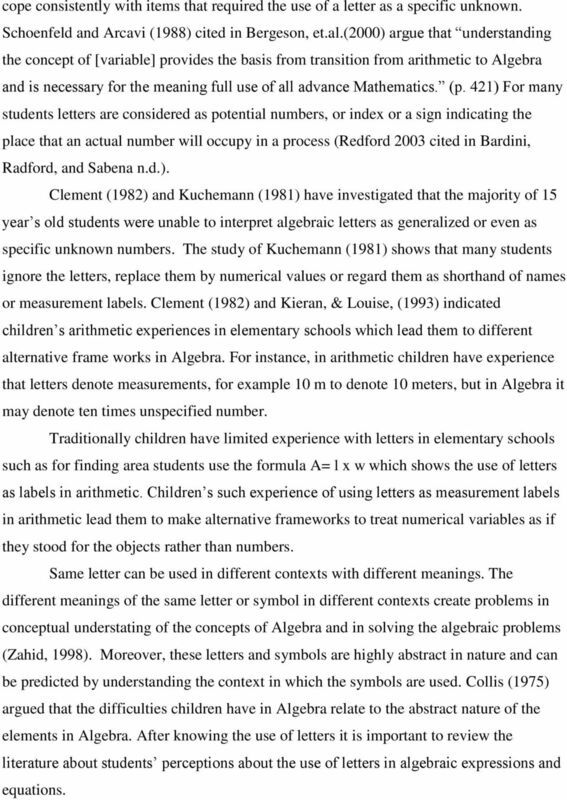 (p. 421) For many students letters are considered as potential numbers, or index or a sign indicating the place that an actual number will occupy in a process (Redford 2003 cited in Bardini, Radford, and Sabena n.d.). 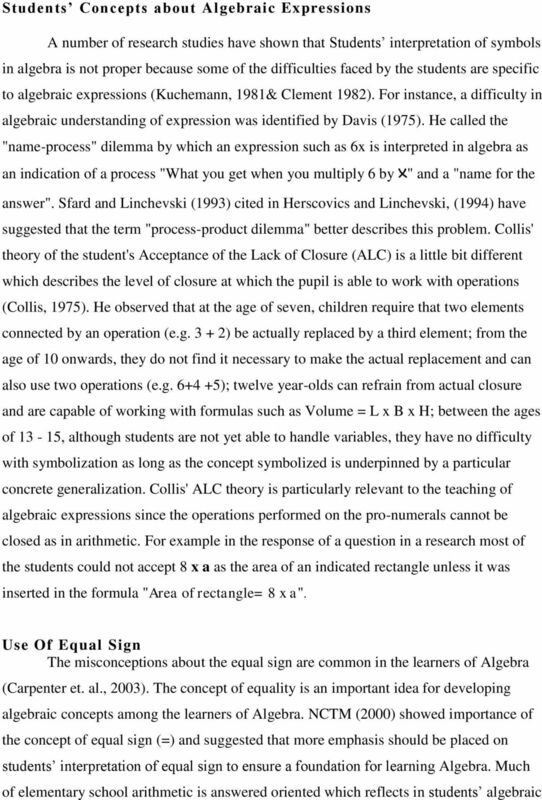 Clement (1982) and Kuchemann (1981) have investigated that the majority of 15 year s old students were unable to interpret algebraic letters as generalized or even as specific unknown numbers. 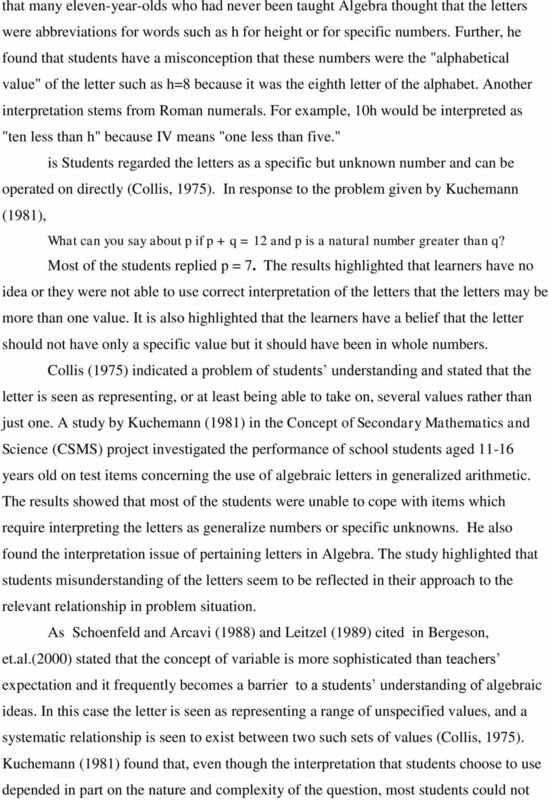 The study of Kuchemann (1981) shows that many students ignore the letters, replace them by numerical values or regard them as shorthand of names or measurement labels. Clement (1982) and Kieran, & Louise, (1993) indicated children s arithmetic experiences in elementary schools which lead them to different alternative frame works in Algebra. For instance, in arithmetic children have experience that letters denote measurements, for example 10 m to denote 10 meters, but in Algebra it may denote ten times unspecified number. Traditionally children have limited experience with letters in elementary schools such as for finding area students use the formula A= l x w which shows the use of letters as labels in arithmetic. Children s such experience of using letters as measurement labels in arithmetic lead them to make alternative frameworks to treat numerical variables as if they stood for the objects rather than numbers. Same letter can be used in different contexts with different meanings. 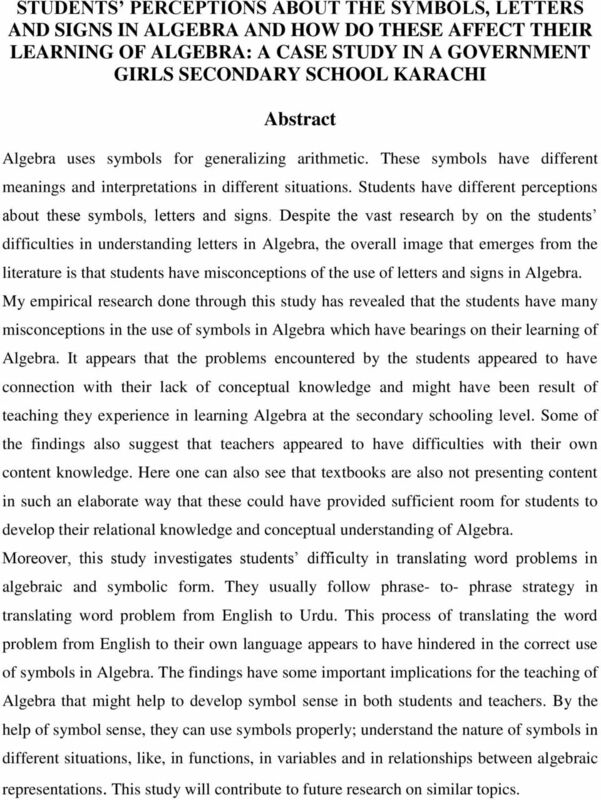 The different meanings of the same letter or symbol in different contexts create problems in conceptual understating of the concepts of Algebra and in solving the algebraic problems (Zahid, 1998). Moreover, these letters and symbols are highly abstract in nature and can be predicted by understanding the context in which the symbols are used. Collis (1975) argued that the difficulties children have in Algebra relate to the abstract nature of the elements in Algebra. After knowing the use of letters it is important to review the literature about students perceptions about the use of letters in algebraic expressions and equations. 11 The above quote highlighted that very big formulas in Algebra make it difficult for her because she could not remember them. Students, who had previously learned algebraic formulae in one context, found difficulty in applying these formulas in other/unfamiliar contexts. Skemp (1986) attributed this difficulty of students ability to use formula in different contexts as instrumental understanding rather than relational understanding of the formula. Relational understanding suggests that students become able to apply their knowledge in solving problems in different situations. The data also revealed that students had some strong rationales for their disliking. They highlighted the problem of interpreting letters and variables and use of letters in Algebra. Moreover, they also indicated that they had some concerns about the methods of solving the algebraic problems which they indicated by saying like, formulae are difficult and when and where to use them. 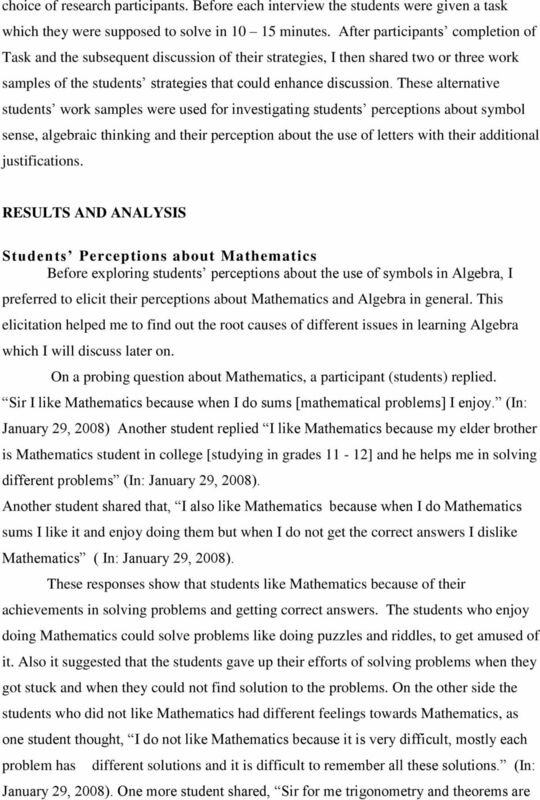 Students Perceptions about The Use Of Letters In Algebra I used different tasks to identify students perceptions about the use of symbols in Algebra. These tasks were based on the concepts underlying understanding of the symbols in terms, in expressions and in equation. Symbols are considered as driving force of algebraic thinking. This research study results have revealed the evidence that students' difficulties in Algebra could be related to their difficulties and misinterpretation of symbolic notations. According to Kieran (1992), misconceptions and common errors are rooted generally from the meaning of symbols. This study highlighted students perceptions which were rooted in the multiple meanings or roles that same symbol assume in different contexts. This study also investigated that students were having difficulties in using, analyzing, or understanding symbols in different situations. It is worthwhile here to closely examine and discuss students' perceptions about the use of symbols in Algebra and discus findings. I used the following task for exploring students perceptions about letters and their skills to use symbols in algebraic expressions: A piece of rope 3 meters long is cut into two pieces. One piece is x meters long. How long is other piece? 14 etc because the given problem was asking about the measurement of other piece. As a student argued, how can we measure x-3 in real situation? (In: Feb 20, 2008). The finding from this task highlighted an important aspect of Algebra which is algebraic thinking. The situation above indicates students lack of algebraic thinking. This indicates that students had no conceptual understanding of the generalization nature of Algebra and the use of letters for generalization which is the basic concept of Algebra. Their lacking in the concept of generalization is also evident from some other tasks where they were accepting 2x+3y as answer but in the word problem they were not accepting the answer with x as a variable or specific unknown. On further probing I found that the confusion was with the wording and real life situation. Probably it seems difficult to cut a rope in 3-x meter piece in a real situation. Students could accept such results in the condition when students have algebraic thinking and the concept of generalization nature of Algebra. 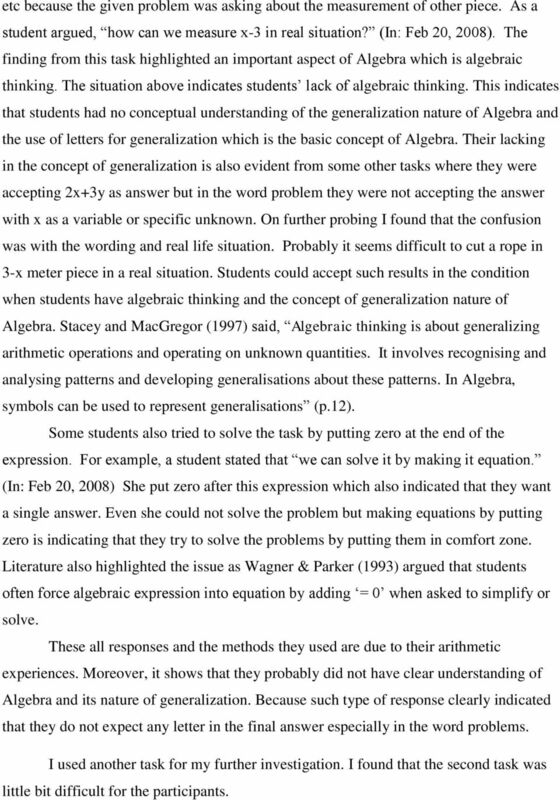 Stacey and MacGregor (1997) said, Algebraic thinking is about generalizing arithmetic operations and operating on unknown quantities. It involves recognising and analysing patterns and developing generalisations about these patterns. In Algebra, symbols can be used to represent generalisations (p.12). Some students also tried to solve the task by putting zero at the end of the expression. For example, a student stated that we can solve it by making it equation. (In: Feb 20, 2008) She put zero after this expression which also indicated that they want a single answer. Even she could not solve the problem but making equations by putting zero is indicating that they try to solve the problems by putting them in comfort zone. Literature also highlighted the issue as Wagner & Parker (1993) argued that students often force algebraic expression into equation by adding = 0 when asked to simplify or solve. These all responses and the methods they used are due to their arithmetic experiences. Moreover, it shows that they probably did not have clear understanding of Algebra and its nature of generalization. Because such type of response clearly indicated that they do not expect any letter in the final answer especially in the word problems. I used another task for my further investigation. I found that the second task was little bit difficult for the participants. 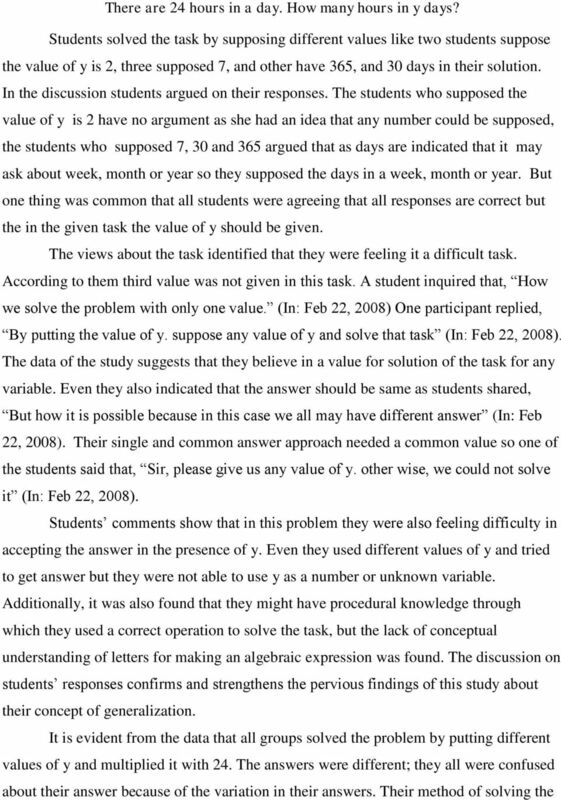 21 It is evident from participants comments that they had a partial concept of variables in Algebra. 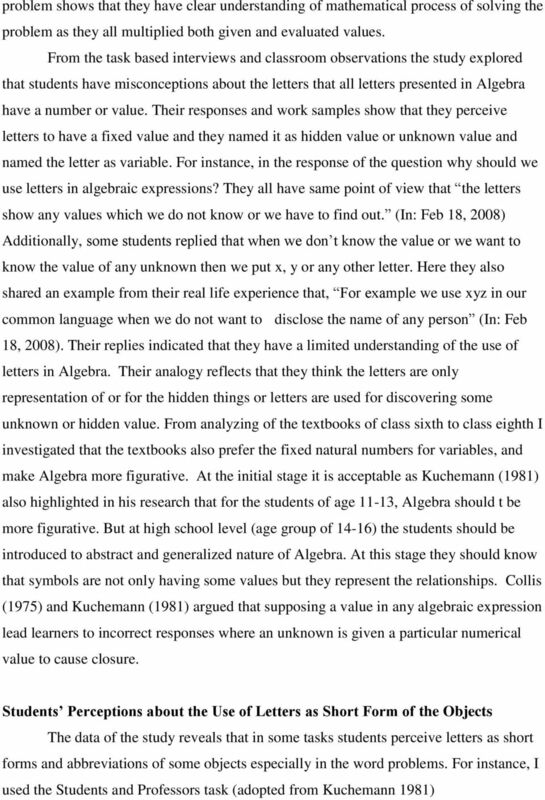 Their responses indicate that they were not accepting different values of variable n which shows that they have a misconception that letters in Algebra have fixed value and they could not show more than one value. This problem involves the comparison of two expressions, both using the same variable. There is a need to think of the variable as taking on a range of values while making this comparison. Their responses show that most of the students used two or three numerical examples to support their responses. 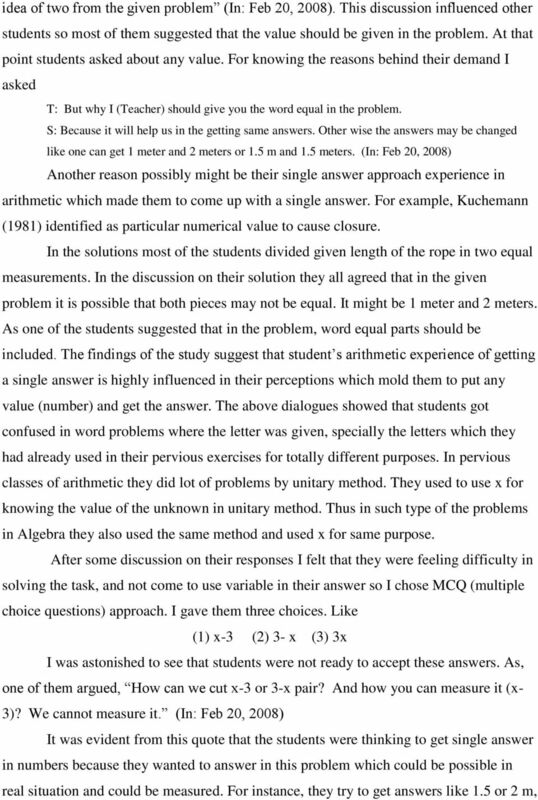 Although these answers were technically correct, they indicated a tendency toward arithmetic thinking unlike more general algebraic thinking. Such as, a student shared that 2n is greater; she argued that multiplication makes numbers larger. This persistent a view of some students that multiplication makes numbers larger than addition. Moreover, the data indicated that all students used only natural numbers as the referents of the variable in this task. It shows that they thought the variable as being only natural numbers. It is possible that they have less experience of using negative or other integers to prove their expressions. The data of my study indicated that after putting different values students experienced that greater than or less than or equal to depend on the given values. 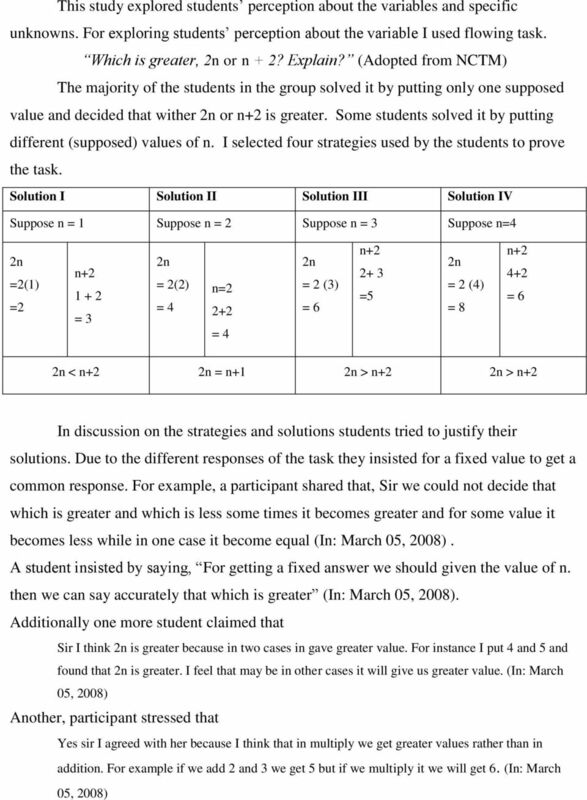 So, most of the students asked for giving them any value fro n. As they argued that how can we say which is greater without any given value (In: March 05, 2008). In such type of situations, students follow their arithmetical thinking rather then algebraic thinking. In addition, they used natural numbers for solving the tasks. It highlighted their perception that in such type of real life problems only natural numbers should be appropriate. It also indicated the problem with their perception about negative integers. For conceptual understanding of the Algebra students should have a clear understating of the concept of negative numbers (Dickson, Brown, & Gibson, 1984). Textbook analysis highlighted that in their pervious classes (seventh and eighth) the exercises and examples of finding relationships or putting values in algebraic expression given in the textbooks gave only natural numbers. So their pervious experience of working with such type of problems with natural numbers is reflected in different tasks given in this study. 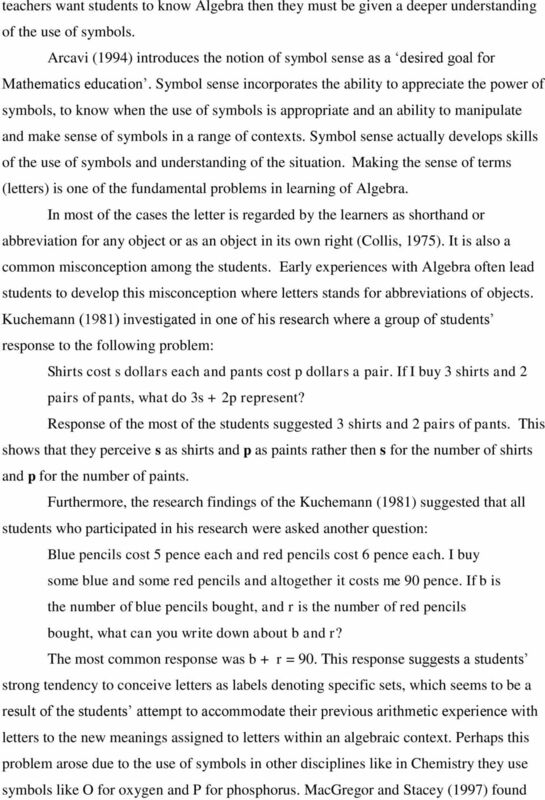 Kuchemann s (1981) study highlights the ease with which beginning Algebra students could associate letters as representing particular values versus letters as representing relationships. 25 so she thought that there were two different rectangles, and she was supposed to give two solutions for these two different rectangles. Second is the figure it self which is separated in two rectangle. On further probing she argued that, I identified that there are two rectangles by a separation line between both of them and different size of the length which are 4 and n (In: March 25, 2008). The above statement highlighted that student had less skills in combining and representing length by using n and 4 to represent 4+n. In the discussion on method III a student stated that, Sir I solved with method III. I took n and 4 as breath and 4 as length, and multiplied all and get 16n. 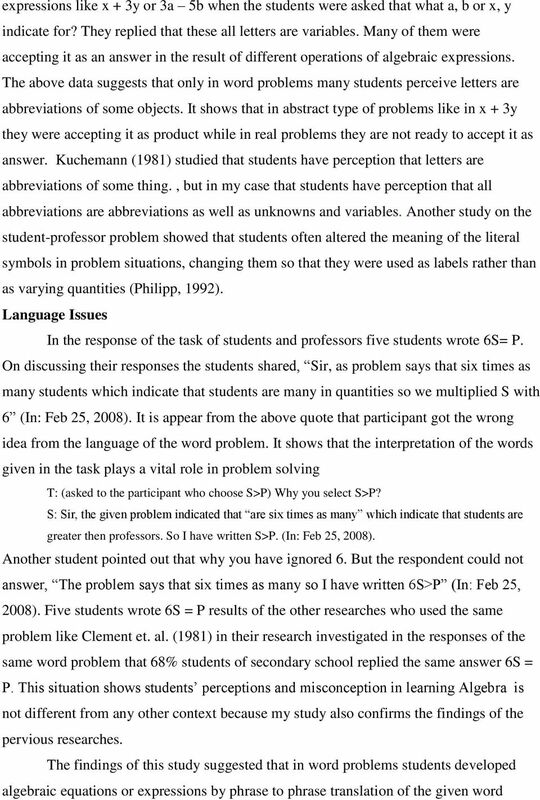 (In: March 25, 2008) Another student said, I think problems of the area we must multiply the given terms. As in this problem we have given 4, 4 and n so for multiplying them we should use the formula which is Area = Length x Breath, by putting length 4 m and breathe n and 4 meters ( In: March 25, 2008) It is evident from their responses and solutions that some students accepted that the length of the rectangle is n and 4. But it is also looking like a dilemma with students perception of the concept of variable that they could not express any number with any variable like 4+n. On probing question if the length of the rectangle is 4 and 8 rather then 4 and n then what will be the length (In: March 25, 2008)? All students agreed that then length would be 12 meters. They also agreed on the process of addition yet they could not write 4+n. This shows that they have no clear idea of how they can get length or breath in the presence of any unknown letter or variable. The data suggested that they have a clear understanding that for getting length both numbers should be added. But they were not able to write 4+ n. For instance in method III, students have clear idea that in bracket they had written (n, 4) they verbally say n and 4 but conceptually they were not adding it. Here the data suggest that they did not have relational understanding however they had instrumental understating of the use of + sign. It further highlighted that their conceptual understanding of the process some times does not help them in symbolic representation. Method 1 was much more frequent where students totally ignored n. I did not found ignoring the symbol in any other case but in this task most of the students ignored it. Collis (1975) also found the same situation in his research and found that novice learners of Algebra may have such difficulty. But at the level of secondary school where learners had already three years experience with Algebra could not be expected of it. Prerequisite Knowledge for the Learning of Algebra! Teaching & Learning Plans Quadratic Equations Junior Certificate Syllabus The Teaching & Learning Plans are structured as follows: Aims outline what the lesson, or series of lessons, hopes to achieve. Tom wants to find two real numbers, a and b, that have a sum of 10 and have a product of 10. He makes this table. Balanced Equations Current California Math Standards Balanced Equations Grade Three Number Sense 1.0 Students understand the place value of whole numbers: 1.1 Count, read, and write whole numbers to 10,000. Elementary School Mathematics Priorities By W. Stephen Wilson Professor of Mathematics Johns Hopkins University and Former Senior Advisor for Mathematics Office of Elementary and Secondary Education U.S. Expressions and Equations Standard: CC.6.EE.2 Write expressions that record operations with numbers and with letters standing for numbers. For example, express the calculation Subtract y from 5 as 5 y. Daily Fraction Five. Fraction Five ~ Fifth Grade. Laying the Foundation for a Conceptual Understanding of Fractions. Fifth Grade 5. Daily Fraction Five Fraction Five ~ Fifth Grade Laying the Foundation for a Conceptual Understanding of Fractions Fifth Grade FRACTION FIVE RATIONAL Fractions present a considerable challenge to most kids. Pupils analyse a numerical puzzle, solve some examples and then deduce that a further example is impossible.